Also serving communities of Manahawkin, Tuckerton, Galloway Township. There are 11 Memory Care Facilities in the Toms River area, with 2 in Toms River and 9 nearby. To help you with your search, browse the 16 reviews below for memory care facilities in Toms River. On average, consumers rate memory care in Toms River 5.0 out of 5 stars. Caring.com has helped thousands of families find high-quality senior care. To speak with one of our Family Advisors about memory care options and costs in Toms River, call (855) 863-8283. Toms River is a town of 93,000 residents in Ocean County, New Jersey. Nearly 20 percent of the population is aged 65 and older, with some requiring specialized care for dementia-related disorders such as Alzheimer's Disease and Huntington's Disease. In fact, throughout New Jersey, there are an estimated 170,000 seniors living with dementia. To care for these people, there are 11 memory care facilities in the Toms River area. Throughout New Jersey, facilities that provide memory care for seniors are officially referred to as assisted living facilities and are subject to the same regulations as those that provide basic assisted living services. 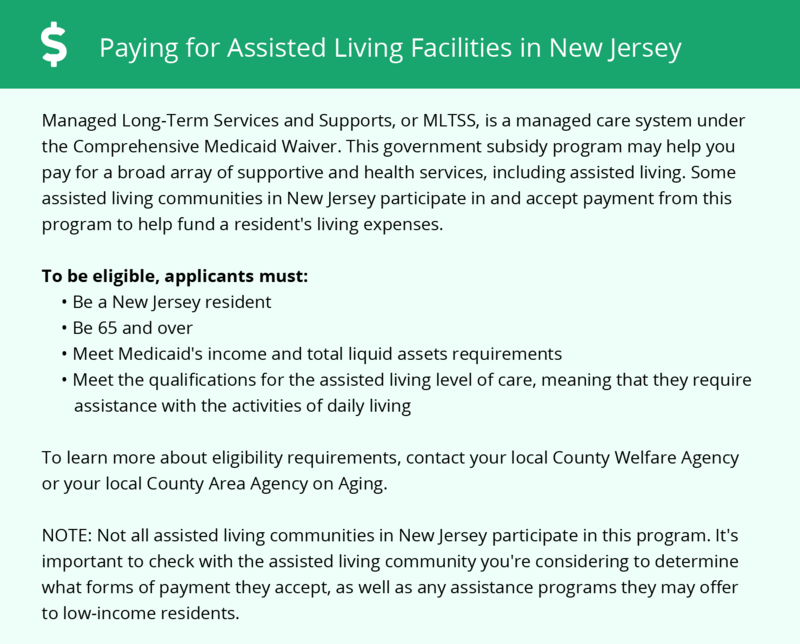 The New Jersey Department of Health and Senior Services is responsible for regulating all assisted living facilities in the state. The Toms River area is home to world-class medical facilities, including those that specialize in brain health and dementia care, such as Community Medical Center in the event of a medical emergency or illness. The American Lung Association has assigned a passing grade to the air quality in Toms River thanks to its low to moderate levels of particle pollution. Seniors can live comfortably in the area without concern that the air they breathe will negatively affect their health. Toms River is safer than 46 percent of U.S. cities, and the town has less than one crime per 1,000 residents each year. Even with low crime rates, it's a good idea to inquire about security when touring memory care facilities to ensure that there are procedures and systems in place to keep residents safe. The cost of living in Toms River is more than 15 percent above the U.S. average, which is likely to affect the cost of memory care, particularly when it comes to room and board charges. Families on a tight budget may find Toms River too expensive and may want to consider memory care facilities in less expensive parts of the state. Memory Care costs in Toms River start around $0 per month on average, while the nationwide average cost of memory care is $4,799 per month. It’s important to note that memory care rates in Toms River and the surrounding suburbs can vary widely based on factors such as location, the level of care needed, apartment size and the types of amenities offered at each community. 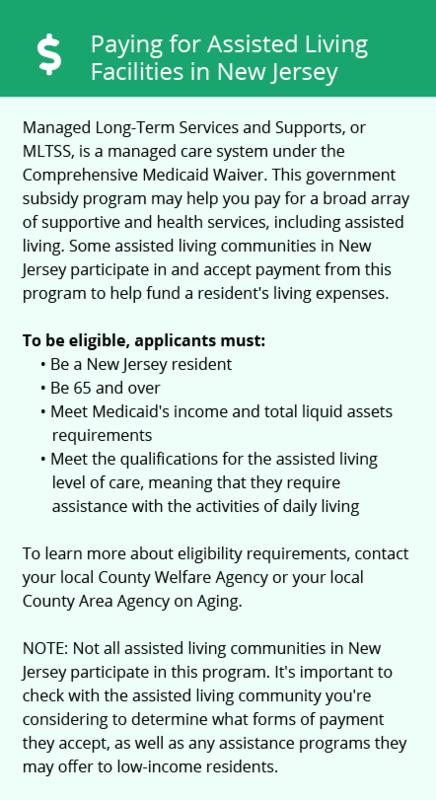 Toms River and the surrounding area are home to numerous government agencies and non-profit organizations offering help for seniors searching for or currently residing in an assisted living community. These organizations can also provide assistance in a number of other eldercare services such as geriatric care management, elder law advice, estate planning, finding home care and health and wellness programs. To see a list of free memory care resources in Toms River, please visit our Assisted Living in New Jersey page. Toms River-area assisted living communities must adhere to the comprehensive set of state laws and regulations that all assisted living communities in New Jersey are required to follow. Visit our Memory Care in New Jersey page for more information about these laws.